and Zen practitioner Natalie Goldberg. Let the Whole Thundering World Come Home. When longtime Zen practitioner and world-renowned writing teacher Natalie Goldberg learns that she has a life-threatening illness, she is plunged into the challenging realm of hospitals, physicians, unfamiliar medical treatments, and the intense reality of her own impermanence. 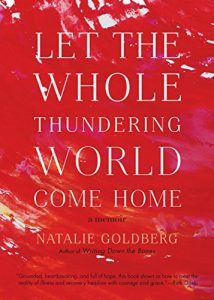 In navigating this foreign landscape, Natalie illuminates a pathway through illness that is grounded in the fierce commitment to embrace the suffering directly. In the middle of this, her partner discovers that she too has cancer. The cancer twins, as Natalie calls them, must together and apart grapple with survival, love, and the rawness of human connection. This book is a moving meditation on living a genuine life in full bloom. Natalie Goldberg is the author of Writing Down The Bones: Freeing The Writer Within (1986), which broke open the world of creativity and started a revolution in the way we practice writing in this country. The book has sold over two million copies and been translated into fourteen languages. Since then she has written 13 other books. Natalie is also a prolific painter. Her book Living Color: A Writer Paints Her World, describes painting as her second art form. Her lively watercolors are exhibited at Ernesto Mayans Gallery in Santa Fe, New Mexico and you can see her paintings on this website. Natalie has been teaching seminars in writing as a practice for the last thirty years. People from around the world attend her life-changing workshops and she has earned a reputation as a great teacher.